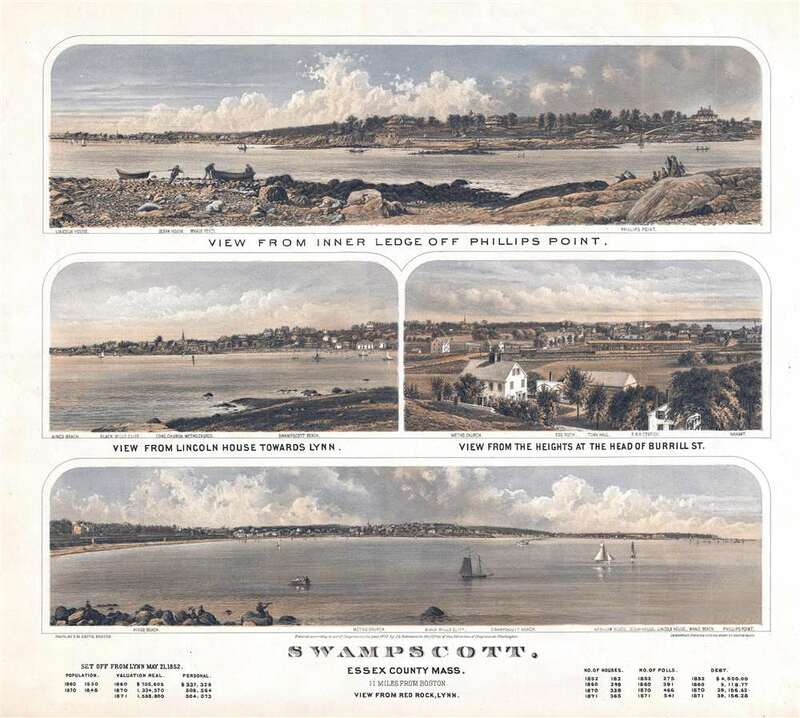 Unusual early locally produced view of Swampscott, Massachusetts. Swampscott, Essex County Mass., 11 Miles from Boston. View from the Heights at the head of Burrill St.
At the base of the map there are real estate statistics illustrating the growth of Swampscott since its incorporation in 1852. A secondary note emphasizes that Swampscott is only 11 miles from Boston. The railroad station, prominent in the Burrill Street view, is prominently illustrated, doubtless intended to illustrate Swampscott as a well-connected. This view, unlike most 18th century views, appears to be a highly localized production and lacks the sophistication of most commercial views of this era. For example, here Swampscott is illustrated low-angle elevation rather than a bird's-eye perspective, as was common. The photographer Frederick M. Smith is little known, but existing photographs bearing his imprint seem to suggest that he was a local landscape photographer based in Lynn, Massachusetts (8 Market Street). The publisher, John L. Robinson, is similarly little known but evidence suggests a local figure in the real estate business. Robinson issued only three views, all in 1871, two of Swampscott and one of Lynn. All three feature real estate statistics in the lower margins. The lithographer, J. H. Bufford, is more prolific and managed a large Boston printing house. Swampscott was first settled in 1629 when Francis Ingalls built the first Massachusetts Bay Colony tannery on Humphrey’s Brook. It was not formally incorporated as a town until 1852, at which point it was beginning to see wealthy tourist arriving for Boston in the summer months. Abutting Salem, Marblehead, and Lynn, Swampscott, with its beautiful beaches, quickly became a haven for Boston's elite. It is considered by some to the America's first resort town. Enormous luxurious hotels, such as Ocean House, identified here at the left side of the top view, were constructed. Many who enjoyed Swampscott during the summer went on to build large stately homes, among them General Electric founder Elihu Thomson’s Georgian revival mansion, now the town administration building. This view is today reasonably rare. Examples are known at the Library of Congress and at the Boston Athenaeum. Very good. Light toning. Blank on verso. Reps, John, Views and Viewmakers of Urban America (University of Missouri, Columbia, 1984), #1651.